Tannus Tires is a Korean company and it has just launched the new Aither 1.1 solid tyre which it claims only has 2% higher rolling resistance than a regular tyre, lasts at least 6,000 miles and weighs 430g. There have been solid tyres before, of course, and anyone with a long memory might recall early attempts that were less than successful. Tannus boldly claim its new tyres are a significant step forward, and it has been developing the tyres since 2003. The Aither tyres - there are two versions, 1.0 and 1.1, aimed at commuters and performance cyclists respectively - are made from a nanofoam polymer. It’s similar stuff to that used in trainers. The tyre has a constant pressure that's about the same as an inner tube pumped up to 100 psi, and it can withstand temperatures of -15º to + 50º. Rolling resistance has been the enemy of solid tyres, but in this department Tannus claims the unique polymer it has used has resulted in a tyre with a rolling resistance just 2% higher than normal tyres. According to Tannus, tests against a Panaracer tyre revealed that when pedalled at the same power output the Aither 1.1 can travel at 29kph, compared to 30kph for the Panaracer. 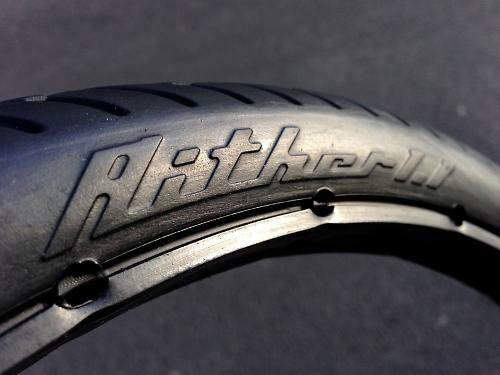 The Aither tyres can be fitted to most regular clincher rims. Each tyre features a series of slots into which plastic strips push, and these then lock into the groove in the rim where the tyre bead normally locates. Solid tyres have been tried before, but without much success. Tannus has aimed to make solid tyres a viable alternative to regular tyres and inner tubes, and with this new tyre claims to have significantly narrowed the gap. We’ve just been sent a pair so we’ll be testing them out with curiosity over the next couple of weeks. We’ll let you know how we get on. Not having to carry a pump and spare tube and there being no risk of a puncture are certainl attractive propositions. Tannus will launch the new Aither 1.1 solid tyres at the upcoming London Bike Show, so if you’re heading to the show make sure to pop along to their stand to have a closer look if you’re interested.